Review: When Summer movie season rolls around each year, sequels, reboots, and franchises tend to dominate this time of year in the Hollywood calendar. So when an original piece of film making comes around, it is a refreshing sight. Even more so when a project lands a director as skilled as Brad Bird at the helm with a script penned by Bird and Damon Lindelof, there is a lot of potential for greatness. Bird proved himself in his live action debut with the best entry in the Mission Impossible Franchise, Ghost Protocol. Combined his animated expertise with great films such as Ratatouille and The Incredibles, with a film based on a theme park attraction that Walt Disney made part of Disneyland in 1955, there was a lot of potential in this adventure. With the trailers leading up to the film, much was shrouded in secrecy, again something to be praised considering many trailers just blunder and throw WAY too much information in before the movie is released (here’s looking at you Terminator Genysis.) The premise centres around this cool, exciting futuristic world, known as Tomorrowland where only a select few number of people get to go to. One of these people is spirited teenager Casey Newton, played wonderfully by Britt Robertson, who comes into the possession of a Tomorrowland pin, which with a single touch, transports her to the titular land for the briefest of moments. Inspired by what she has seen, she tries to understand what this place is and how to get to it. 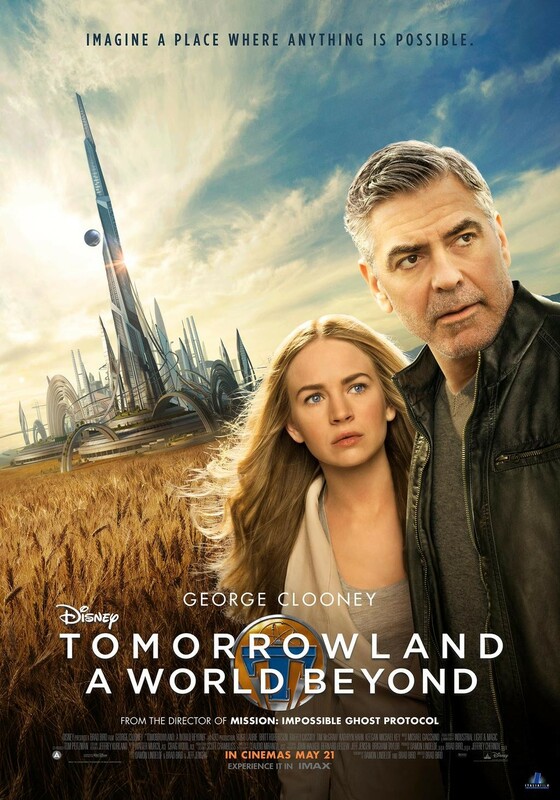 Her search leads her to Frank (George Clooney) who has become a downbeat, somewhat depressed former child prodigy (for reasons you will find out) and Casey believes he has the answers to her questions surrounding the mysterious realm of Tomorrowland and the visions she has seen. As previously mentioned, Bird has almost a perfect track record when it comes to the previous movies he’s been at the helm of, and with his latest adventure, there are undoubtedly elements that are absolutely superb. For instance, the visuals are absolutely flawless. The look and feel of Tomorrowland, as if it is a place you could actually go out and visit, is tremendous and much praise must go to Bird for the visuals and the flawless direction that is on show throughout the duration of our ride in Tomorrowland. With solid direction, our leading lady, Casey provides charm and humour, whilst also holding the movie on her shoulders and giving a very solid performance. Likewise with George Clooney, though his character’s circumstances mean he may seem like a miserable old sod, but there is empathy for him and he does not wallow in his self pity and works with Casey and the duo have excellent on screen chemistry. The chemistry between Clooney and the breakout star of the film, Athena (Raffey Cassidy) while also decent, could have been greatly improved in parts. Yet the biggest downer of this film is the script. With such an inventive premise that could have gone in so many unique and interesting directions, it falls flat on its face at times, particularly within the third act. A lot of the momentum and build up that was very exciting in the previous two acts, was ultimately thrown away. In addition, the whole premise of the movie being Tomorrowland and what is this magical and mysterious place, yet the glimpses of the world are few and far between.. The movie almost dangles the carrot of Tomorrowland in front of you and then only gives you the tiniest bit when you came wanting more, so much more. With it emerging that Brad Bird chose to make this when he had the opportunity to direct The Force Awakens, it will undoubtedly leave many frustrated. While Bird’s latest foray into live action was exciting and intriguing, and he gives it his all one cannot help but wonder that Bird’s decision to direct this instead of Star Wars really feels like it was a missed opportunity for something truly spectacular, something truly out of this world. Something this unique and original does not come along every day, and with top notch visuals and some excellent leading performances, there was much potential, which ultimately was squandered with a lacklustre finale, and that is a real shame.